For the last few weeks, I’d been looking forward to yesterday and today because I’d planned to take the two days off my regular job, give myself a four day weekend and get stuck into some project or another in the business and bang it out during that time. Earlier this week I was travelling for work and came down with an infection. As the week progressed it just got progressively worse, but it was nothing worrying. Like most of these things, it just knocks you about physically, makes you irritable and leaves you with an overall feeling of lethargy. The infection sort of peaked yesterday on my first day off which was kind of the universe’s way of poking me in the eye for a bit of fun. Not feeling like doing anything, my wife and I went out for a bit of retail therapy. One thing that caught our eye was a new Nespresso machine. I like my coffee. It’s one of those tiny pleasures in life that I savour. Living in Australia, we’re blessed with a very strong coffee culture and the quality of what you get anywhere you go is incredibly high. When I see people talking about Starbucks or Tim Horton’s taste buds just kind of revolt in protest. The bath part is me being silly, but he does warm up my milk before making my coffee. Our intention was to go into the Nespresso store yesterday, see if they had any flavours or blends and buy some more pods. It was a simple plan. But then my wife saw the new VertuoPlus machine. A couple years back, Nespresso’s patent on their coffee pod system expired and so people have been making pods that are “compatible” with their traditional machines. The Nespresso business model hinges on your buying the coffee pods from them over a three to five year period, so this was no doubt a risk to their business. To combat this, they redesigned their delivery system and pod technology and created the Vertuo line of pods. The Vertuo pods are like stepping into the future and at the same time addressing some of the shortcomings of the traditional Nespresso pods. The new pods come in four different sizes so if you want an espresso shot, a cup, a mug or a grande size, they now have you covered. When you think about it, creating a single delivery system capable of delivering four very different sized beverages is pretty complex to get right. But Nespresso has pulled it off beautifully. Each pod has a barcode built into the rim so you simply insert the pod into the machine and it reads the barcode so it knows how much water to give it based on the type of pod you’re using. It doesn’t stop there. The VertuoPlus machine we bought is all “single touch” – you touch the silver handle and it automatically opens up, discarding the previous pod and presenting you with the ability to insert the new one. Then you touch the silver handle again and it closes the lid. Finally, you press the single button on the machine and the whole thing kicks off making your coffee. There’s no lifting or multiple button presses – everything is done with simple, single touches. Once the machine fires up it starts spinning the pod and running the hot water through – this little innovation of using the centrifugal force ensures that the water reaches all of the coffee within the pod evenly and at the same time it aerates the coffee creating a nice coffee crema atop your drink. I think it’s pretty easy to see that I’m impressed and to be honest, for just AUD$300 it seems like a complete bargain – when the guy told me the price I thought he’d made a mistake, I was expecting to pay $500. What Nespresso have done is something I think the best companies always find a way of doing – they take something complex and they make it both elegant and simple for their customers. Simplicity is easy enough to understand – push the handle the lid opens, push it again to make it close and then push the button on top to make coffee. You can’t really screw this process up and that’s an attractive feature. Elegance… That’s much harder to achieve. They could have made you “lift” the handle and manually close it, but they didn’t – you literally just touch it. The elegant part of this solution is that by making it less “force” driven, the machine will have less wear and tear so their warranty calls will be reduced. By integrating the barcode into the pod, they eliminated the need for having different “size” buttons and making people think about what button equates to which pod or accidentally pressing the wrong button. That’s an elegant way of solving that user interface issue. The iPod was a revolution in MP3 players because Apple created an elegant solution and when they added the trackwheel, they largely eliminated the competition because it was an easier interface. You could talk about the iPhone and elegance until the cows come home. In your business, think about how your customers experience working with you or even your competitors. What does their decision-making process look like for how they choose? What does their user experience feel like when they buy and use your products or services? There are always ways to improve the overall elegance and simplicity of what you do. For me, making things more elegant is a form of viscosity – it lubricates the entire customer experience and lifecycle. It creates a better overall experience which makes it easier for people to become repeat customers and refer you to other people. 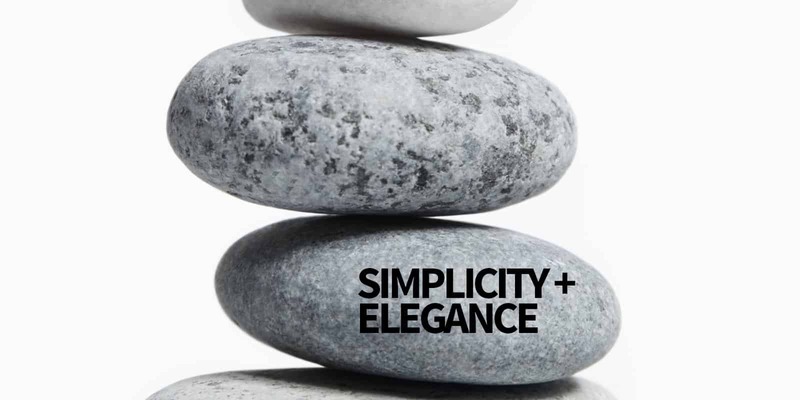 Spend some time this weekend thinking about companies that offer simple and elegant solutions and then think about how you can reduce the friction and increase the viscosity of your offerings by simplifying things and adding in a splash of elegance.